Another term draws to a close, and it's time to celebrate all the good things that have happened this term. The children in the photograph below were awarded certificates for being present each day this year, without ever being late. That's 130 days, without being ill! Well done to everyone involved. See if you can make it all year without being away! Every child that received more than 50 House Points were awarded their Bronze House Point award, and those with more than 125 House points gained their Silver award. All children should now concentrate on attaining their Gold award in the summer term. Then it was time for the House Points to be counted up. The house with the most House Points during the Spring Term was Sycamore. 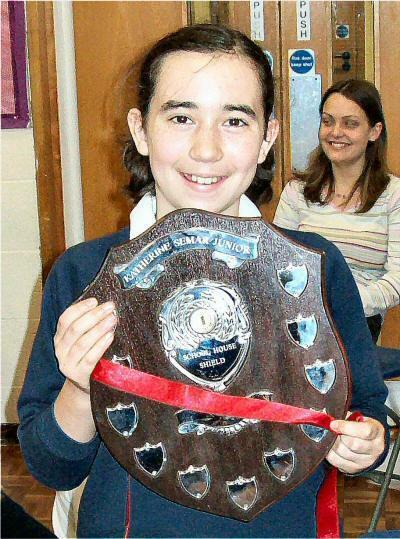 Below is a photo of one of the house captains receiving the shield.